Matt Hagan has never seen a rollercoaster ride he didn’t enjoy. Rollercoasters are almost as fun as driving his 10,000-horsepower Funny Car. Hagan, 34, has been on an emotional rollercoaster ride ever since the 2016 season ended back in November. Off-seasons, at least the ones Hagan has experienced for the last decade, are usually level playing fields with time spent with family and catching up on chores related to his 2,000-acre farm located just outside of Christiansburg, Va. In October, he and wife Rachel added a third child to their family. A week after the new year began, Hagan and his family were rocked when, in the early morning hours of Jan. 8, Kyle Hagan, 33, died from an apparent brain aneurysm. A month earlier his paternal grandfather passed. “It’s been tough,” Hagan admitted. “I mean there’s no doubt about it. I lost my grandfather and my brother all in the same month there. It’s one of those things where your grandfather, you expect that stuff. Kyle was laid to rest on the family property in a private ceremony. Witnessing the pain on his parents’ faces was enough to hit the tough-as-nails, muscle ripped Hagan in the one area he couldn’t protect – his heart. Hagan immediately felt the pain not as a brother, but as a sympathetic parent of three children. “I hate losing my brother, but I can’t imagine after my wife put in the work with my kids and just going through that, what it would be like to lose a child,” Hagan said. “That’s been really tough. And just been trying to be strong for them and be there to give the support that I can. “It’s very, very unfortunate. Very tragic. You’ve just got to hang tough and be tough for your family and be strong. And that’s all I know how to do. It’s just the hand that you’re dealt right now, and you have to go out here and try to internalize it and not let it get to you too much, and make good on it on the racetrack. 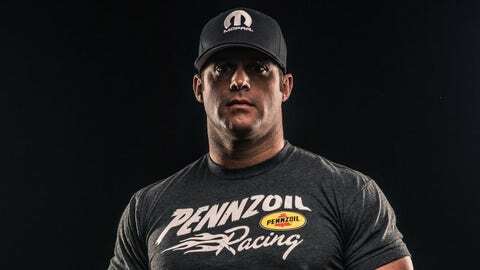 With less than a month to heal from the tragedy, Hagan returns to the seat of his full-time occupation this week, driving a Dodge Charger Funny Car for Don Schumacher Racing. There’s a challenge to compartmentalizing affairs of the heart and doing what you’re paid to do. Hagan will participate in this week’s NHRA nitro testing at Wild Horse Motorsports Park outside of Phoenix, Az., and his biggest test won’t be in making his 320-mile per hour car faster. He will be challenged to do this with the memories of the painful tragedy in the back of his mind. “You say a prayer before you get in, you pray with your preacher, you think about your wife and kids in everything that you do,” Hagan explained. “But, when that [Funny car] body comes down, it’s total focus on that Christmas Tree and trying to do everything that you can for your team. I mean, it’s not really fair for my team if I get on that airplane and I’m thinking about everything that I left at home, and everything else going on. Hagan, a two-time NHRA Funny Car series champion and 22-time national event winner, isn’t reserved when admitting he’s racing this season a little more fired up and inspired than ever. “I’m always inspired as far as I set goals for myself,” Hagan said. “I’ve done things here and there that you always want to achieve and accomplish. This year I’m very, very passionate, obviously because of my brother and different things. But sometimes when you lose someone that close, and that young, it really puts stuff in perspective, and you know, you don’t get do-overs a lot of times, so make the best out of what you’ve got. “I think it really kind of hit home with me that every day, and every race, and every round is important. Don’t just go through the motions, and make the best out of everything because you might not wake up tomorrow man. So, definitely put a lot of things in perspective. I’ve had to do some soul searching. And honestly, I’ve been really mad since it happened and I had to figure out how to come to peace with that. And a lot of it was just not taking anything for granted and really just making the best out of every moment that you have.